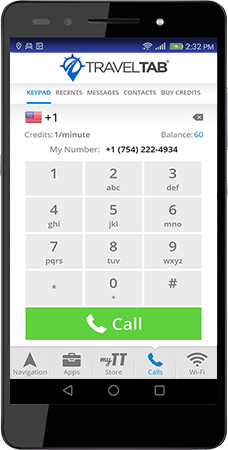 Leave costly phone rates behind with the TravelTab phone. Call and text your family, friends and colleagues right from your TravelTab and never worry about expensive roaming fees on your monthly bill. Traveling out of country? We’ve got you covered! TravelTab is equipped to make international calls, too. Stop swapping temperamental international SIM cards that may or may not provide a clear, quality connection and enjoy all the travel tools available in one place to enhance your trip. Simple and affordable, your TravelTab rental comes pre-loaded with a generous amount of phone/text credits for each day of your trip. Need more credits? Use our simple checkout process to load more credits whenever you run low. It’s that easy.